In this post I will give a step-by-step explanation of my Drupal to WordPress migration SQL queries. For general information about migrating from Drupal to WordPress, please see instead my Drupal to WordPress Migration Guide. Since I offer site migration as a paid service, readers might be wondering why I’m giving away some of my secret sauce. The simple answer is that the ingredients of the sauce are anything but secret. A web search brings up blog posts and tutorials detailing how to go about it. In fact, the first version of my own Drupal to WordPress migration tool was based on a blog post by another web company. If you are a developer with the right skills, you still need to consider the time investment and effort needed to understand both Drupal and WordPress database schemas. Often, the man-hours required will make a client think twice about proceeding with the project. Fortunately (or unfortunately) for me, I’ve needed to put in the time because my maintenance agreement for some clients covered exactly this sort of work. I’ve therefore built up enough experience to offer competitive quotes for migration of even complex sites. In my very biased opinion, you’ll make better use of your time and budget by getting me to do the task! Of course, there are still cases where, for whatever reason, it’s not viable to offload the work to someone else. If this sounds like your situation, you’ll probably figure things out eventually so I might as well help you along. Access to the Drupal and WordPress installations. Have planned the migration beforehand (e.g. which content types and taxonomies should be migrated). If you have an older version of Drupal, simply upgrade to Drupal 6 first, then run the migration. I mention WordPress 3.5 as a prerequisite because that’s where I’ve done most testing. You can probably get away with migrating straight into a more recent version but to avoid any problems, I suggest you start off with WordPress 3.5. It’s easy to upgrade to the latest WordPress version after converting the Drupal content. Keep in mind that this article is based on my Drupal to WordPress migration tool but with some additional queries written for the specific needs of a client. It therefore includes some values which will not apply to your site. I’ve stripped out any identifying information but left generic data to provide an example. You will need to manually look up the correct values in the Drupal database for your installation. Another thing to keep in mind is that I’ve favoured readability over efficiency. For example, it’s possible to write more complex queries to avoid creating working tables but that would make debugging more difficult. Having a trail of data changes can help with content analysis if the end results aren’t what you expected. CAUTION: Make a backup of both your Drupal and WordPress databases before running these queries. USE IS ENTIRELY AT YOUR OWN RISK. I’m offering this information with no warranty or support implied. wordpress: the WordPress database name. drupal: the Drupal database name. acc_ table prefixes: these are working tables I create to help with migrating data. For most migration projects to date, I’ve needed to run through several passes of the queries as I make incremental adjustments based on the client’s feedback. I define a ‘pass’ as one iteration of the entire migration process and inspecting the results in a WordPress installation. Depending on your project requirements, you may need to do this several times, making little tweaks to the MySQL queries as you go along. These Drupal and WordPress tables may be empty or non-existent if you’re running the queries for the first time but it makes sense to clear them out at the start. For some installations, I make changes to the wp_usermeta table so that needs to be cleared too. Delete unwanted vocabularies. You’ll need to look in your Drupal vocabulary table for the appropriate vids. In this case, I’m deleting vocabularies 5, 7, 8, 38 and 40. You may want to merge terms. In this example, I am merging the previously saved terms for News which has vid 38 to the Tags vocabulary terms which has vid 2. We will need to deal with duplicates. For example, in the Drupal installation, ‘science’ could appear in both News (vid 38) and Tags (vid 2). This will cause a problem when exporting to WordPress since we can’t have duplicate terms. Here I create working tables for both term groups. Create a working table from duplicates. Append a string to News terms duplicates so they won’t clash during migration. Here I used a fixed string but this won’t work if you have more than two terms with the same name. If you expect many terms with the same name, it would be better to generate a unique number. For example, using the tid would make it unique since these are unique primary keys. Use whatever string makes sense for your project. Note that we’re overwriting the source data in the Drupal term_data table so proceed with care. Make sure you have a backup of your pre-migration Drupal tables in case you need to run the conversion again. Convert Drupal News terms to Drupal Tags. We’ll migrate the whole lot into WordPress tags later. Create a table of WordPress tags. Exclude any terms from Drupal vocabularies that you might later migrate into WordPress categories. See the MySQL queries below where I create WordPress categories and sub-categories. Here, all Drupal vocabularies except 37, 36 and 35 will be converted WordPress tags. Now create the tags in the WordPress database. A clean WordPress database will have term_id=1 for ‘Uncategorized’. Use REPLACE as this may conflict with a Drupal tid. We are assuming that this point the Drupal term_data table has been cleaned of any duplicate names. Any duplicate terms will be lost when running this MySQL query. In WordPress, tags and categories are all stored in the wp_term_taxonomy table. The taxonomy field specifies whether it’s a tag or category by setting the field string to either ‘post_tag’ or ‘category’. Here I convert these Drupal terms into WordPress tags. Create the categories and sub-categories in the WordPress database. This may be unnecessary depending on your setup. Add terms associated with a Drupal vocabulary into WordPress. Note that in this case, these are the same vids that I excluded from the tag table above. Convert these Drupal terms into WordPress sub-categories by setting the parent field in the wp_term_taxonomy table. Now add the vocabularies to the WordPress terms table. There’s no need to set term_id as vocabularies are not directly associated with posts. Insert Drupal vocabularies as WordPress categories. Update the WordPress term groups and parents. Before continuing with this step, we need to manually inspect the table to get the term_id for the parents inserted above. In this case, vids 37, 36 and 35 were inserted as into the wp_term_taxonomy table as term_ids 7517, 7518 and 7519. I will use them as the parents for their respective terms. In other words, terms that formerly belonged to the Drupal vocabulary ID 37 would now belong to the WordPress parent category 7519. Re-insert the Uncategorized term replaced earlier in the conversion process. We may have replaced or deleted the Uncategorized category during a previous MySQL query. Re-insert it if you want an Uncategorized category. 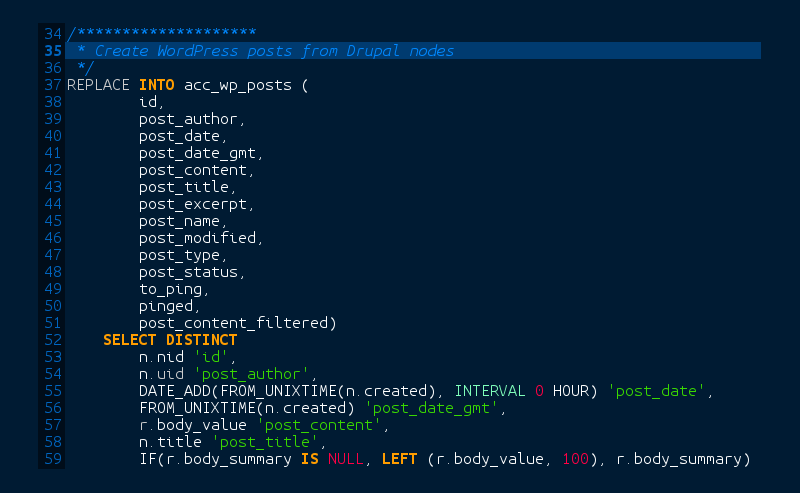 Now create WordPress posts from Drupal nodes. This may take a while if you have many Drupal nodes. Wait until the query completes before continuing. It could take several minutes. Set the Drupal content types that should be migrated as WordPress ‘posts’. In this case, I want ‘page’, ‘story’, ‘blog’, ‘video’, ‘forum’ and ‘comment’ in Drupal to be converted to posts in WordPress. Now convert the remaining content types into WordPress pages. Here I associate the content with WordPress terms using the wp_term_relationships table. We need to update tag counts. Now set the default WordPress category. You’ll need to manually look in the database for the term_id of the category you want to set as the default WordPress category. In this case I am migrating only users who have created a post. This was a requirement for my project but may be unnecessary for you. First delete all existing WordPress authors except for admin. Now set Drupal’s admin password to a known value. This avoids hassles with trying to reset the password on the new WordPress installation. Resetting a user password in WordPress is more convoluted and cannot be done using a simple MySQL query as in Drupal. Create a working table of users and the number of posts they’ve authored. I am only considering authors who have created posts of the content types I want to migrate. Now add these authors into the WordPress wp_users table. First set all these authors to WordPress “author” by default. In the next MySQL query, we can selectively promote individual authors to other WordPress roles. During the course of the migration, some posts may end up not having an assigned author. Here I reassign authorship for these posts to the WordPress admin user. In Drupal, comments are treated as nodes and comment authors are stored along with other node authors in the Drupal users table. WordPress treats comments and comment authors differently. Comment authors in WordPress are not stored in the wp_users table. Instead, they’re stored along with the comment content itself in the wp_comments table. Running the following MySQL queries will throw errors if you haven’t created the required tables above. First create a working table of Drupal users who have created a Drupal comment. Now add the author information for these users into another working table. Using the above table, next build a working table of Drupal users who have commented but have not already been added to the WordPress wp_users table. Combine the tables into another working table acc_wp_users. The acc_wp_users working table helps when inspecting the user list. For example, you might want to clear out inactive users or spam posters. Once finished, remember to replace your WordPress wp_users with the cleaned acc_wp_users table. You may prefer to amend the above query to insert directly into the WordPress wp_users table. I realise this is a rather round-about way of migrating comment authors from Drupal into WordPress but find that having working tables helps with debugging. Update file path for the WordPress installation. Set your WordPress site name using the Drupal ‘site_name’ variable. Set your WordPress site description using the Drupal ‘site_slogan’ variable. Set the WordPress site email address. Set the WordPress permalink structure. Here we’re using /%postname%/ but you may set it according your own needs. This table will not be used for the migration but may be useful if you need to manually create redirects from Drupal aliases. You will need the entries here for search engine optimisation (SEO) of your new WordPress site. Now that we’ve finished converting the content over from Drupal to WordPress, we have the rather (not very) fun job of checking the content, setting up any WordPress plugins and widgets, then finally going live. Depending on the complexity of your Drupal installation, this process can be extremely time-consuming and perhaps form a separate project in its own right. You can use my Drupal to WordPress migration notes to help with going live. Of course, the search for equivalent WordPress plugins and conversion from the old Drupal modules will have to be done according to your specific set-up. Before finishing this article, one point I’d like to convey is the importance of accepting the limitations of any migration process. You, or your client, may be insistent on turning your new WordPress site into an exact copy of your former Drupal installation. While this may be technically possible, there comes a point of diminishing returns where the work you’d need to put in just isn’t worth the value of the data. It may also be more productive in some instances to make manual adjustments via the WordPress control panel than to try anything clever using the backend database. Sometimes the time needed to write, test and debug MySQL queries far exceeds the boring but more reliable editing using the web-front end. Expect to kill your SEO if you’re not careful with the migration. A site that relies heavily on revenue from search engine rankings will need extra steps to preserve SEO. This is a huge topic so I will not cover it here but you should carefully plan the conversion steps before starting with the migration. Pay particular attention to preserving Drupal path aliases, taxonomy listing pages and internal links. So that’s it. A Drupal to WordPress migration can be a great deal of effort. I’ve had one project that initially looked like only couple of hours work balloon to over 50 billable hours in total. Previously installed modules caused problems requiring custom MySQL queries and PHP scripting to resolve. On the other hand, I’ve had a number of sites that completed in 15 minutes after running my Drupal to WordPress migration tool. Overall, the majority of my clients prefer WordPress over their previous Drupal site. I personally find WordPress quicker to update and manage. Any short-term hassles with migrating have been outweighed by the long-term advantages of easier maintenance. You can find the code on my GitHub repository. The queries in this article can be found in the file drupaltowordpress-custom.sql. I’d love to receive corrections, bug fixes and suggestions for improvements. Please contact me or submit an issue on GitHub.